A great bio would probably start with those three words. But this isn't a great bio, or even a good one. In fact, it's not really a bio at all. If you'd like to find out more about what I do or who I am, the best way is to look around this website, scroll through my instagram, or send me an email. You can also read my 1986 school report, which is still a more accurate description of me than I could ever write myself. I'm bad at writing bios. I have trouble summing myself up in a paragraph or two, and I generally think bios are bad. Not evil bad, just bad at their job. I feel like each day deserves a new bio, or at least an updated one. Some days I wake up and write stories. Some days I draw pictures. Some days I don't really do anything, other than think about why I'm not being that thing that I claimed to be in my bio. I like to be something for a bit, and then not be it, and then be it again. But that doesn't sound good in a bio. You can't be a writer who's not writing at the moment, or an illustrator who hasn't drawn for a year in your bio. But in life, you can. You can be everything, anything, and nothing. All at once. Lee Crutchley is a writer from a small town in England that nobody has heard of. He currently lives in Berlin. His latest book THE NOCTURNAL JOURNAL explores the darkness, light, and magic that can be found in the hours when you should be asleep. It’s available now through Penguin Random House. His next book GET LOST! A TRAVEL GUIDE FOR ANYWHERE will be published in March 2019. Find out more at LeeCrutchley.com. Lee Crutchley is a writer and artist based in Berlin, Germany (although he is probably somewhere else as you read this). His previous books include The Nocturnal Journal and How to Be Happy (Or at Least Less Sad). He wrote this book while surrounded by elephants in South Africa, ice fishing on a frozen lake in Norway, snorkeling the turquoise oceans of the Seychelles, eating lemon-flavored ants in Denmark, staring into the eyes of great white sharks in Gansbaai, walking for miles through the snowy streets of Berlin, and in many other places both near and far. His most treasured possession is his passport. Lee Crutchley is an artist and author from a small town in England that nobody has heard of. He is currently based in Berlin. His books start with him, but end with you. His latest book The Nocturnal Journal (Penguin Random House) explores the darkness, light, and inspiration that can be found in the hours when you should be asleep. He enjoys eating cheeseburgers, staying up late, and walking as far as his feet will take him. He hates writing bios. Thankfully when he was 5 years and 6 months old his teacher, Mrs Salt, wrote this school report which is as accurate now as it was then (although he does now have his green swimming badge). Lee Crutchley is an artist and author from a small town in England that nobody has heard of. He is currently based in Berlin. His books start with him, but end (and grow) with you. His latest book The Nocturnal Journal (Penguin Random House) explores the darkness, light, and inspiration that can be found in the hours when you should be asleep. Lee Crutchley is an artist and author from England who is currently based in Berlin. His previous books ave been translated into nineteen languages, and he is embarrassed to admit he can only speak one. Obwohl er sein Bestes gibt, um Deutsch zu lernen. I’m a London based author and artist who is interested in making work about me, and you, and how we fit into the same world. My work used to be less dark and more funny, just like the world I guess. A lot of things make me sad and anxious these days, but even more things make me happy. I like to travel to places I've never been, eat cheeseburgers, and leave things till the last minute. I have more questions than answers. I’m an artist and author from a small town in England who currently lives in London. I hope my books will make the world a better place, even if it’s only in tiny ways. I hope my work will make me a better person. “My work” means all of the creative things that I like, or would like, to do. At the moment I’m trying to focus on writing more and thinking less. I’m interested in making work about me, and you, and how we fit into the same world. My work used to be less dark and more funny, just like the world I guess. A lot of things make me sad and anxious these days, but even more things make me happy. I like to travel to places I've never been. I have more questions than answers. I have too many ideas for my own good, maybe you’d like some? 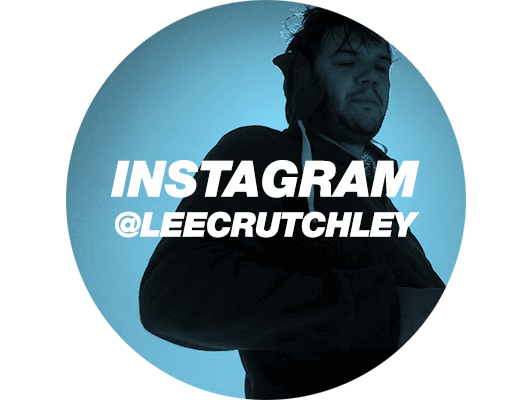 Hello, I’m Lee Crutchley, a tall human from a small town in England. I'm also an artist and author. I use the word ‘artist’, because saying 'I kind of do lots of different creative things and I'm not really comfortable with any kind of label at the moment’ doesn’t sound very professional — even though it's true. I use the word ‘author’, because I write books. My latest is called How to Be Happy (Or at Least Less Sad), you can find out about the others here. For an independent character reference, please see my 1986 school report. Lee Crutchley is a big dumb idiot from England. These are his books. Lee Crutchley makes books and draws pictures in a small town in England. He is writing this in the third person, even though it feels weird to do so. Right now he's wondering if he should make this sound impressive and authoritative or funny and likeable. He is giving up on both. He is not a doctor and has no qualifications in the area of mental health; he just gets really sad sometimes. He thinks you should seek the help and advice of a professional if you feel like you need it, and probably even if you don't. An artist (I guess) and author (fact) from a small town in England that no-one has heard of. At the moment I'm mainly making books, drawing pictures, and feeling less sad. Lee Crutchley is an independent illustrator and designer from England. He loves hand lettering, tea, and cartoons. He hates writing bios. He has been drawing quotes almost every day for the last 3 years as an ongoing personal project called Quoteskine. Lee Crutchley is an illustrator + designer from England. He hates writing about himself in the third person. But now he's started he has to go with it...or does he? Can I just start writing like this and it be ok? I think I can. Ok hello, I'm Lee Crutchley. I like to draw letters, design things, and generally make cool stuff. I work in as many different areas of art and design as possible, most notably design, illustration and art. The common theme running through almost all all of my work is words and lettering. This website is an evolving project that will reflect the things I've been working on most recently. The archive section will give a more in-depth look at the history and progression of my work. I like to make work about: Reality. Love. Disappointment. Messages. Childhood. Relationships. Hope. Failure. Dreams. Pop culture. Broken hearts. The past. The future. And many more things that I suppose all fit under the heading of "Life". I'm always interested in working on exciting projects, exhibitions, or collaborations. I was born in 1981, and I'm still trying to figure the rest out. I have some pens and pencils. And a head full of quotes, lyrics, and the like.